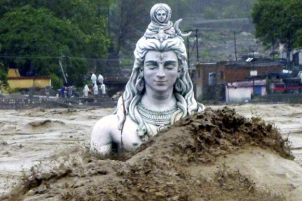 Do you remember the dramatic floods in the Western Indian Himalayas back in 2012? We blogged about the Uttarakhand disaster and about the thousands of victims, while watching images of rescue operations in helicopters and reporters describing the dramatic situation on national TV channels. Yet, the neighboring state of Himachal Pradesh should have got the same national and international attention. In the valleys of bordering districts of Kinnaur and Shimla, flooding waters were destroying villages and submerging fields, while leaving thousands of people dead. More recent alike events occurred in the North-western district of Chamba in March 2015, when a massive landslide triggered by heavy rains damaged the Saal hydropower project. Himachal Pradesh is generally celebrated for its landscape, as the abode of snow and rivers that have always rendered the state a distinct identity. Even today, the state seems somewhat idyllic and ideal – with a semblance of balance. The image is cultivated that the State government is a good provider of welfare services and the mountain people co-existing peacefully with the landscape. In 2000, the state announced its commitment to become the “green state” of India, through fostering so-called renewable energy, clean industries, sustainable tourism models and other progressive policies. However, a closer look reveals that, like in the rest of the country, there is a crisis in the making here. Many protests against hydropower projects are ongoing but also other controversial extractive industries have been going on for decades now. 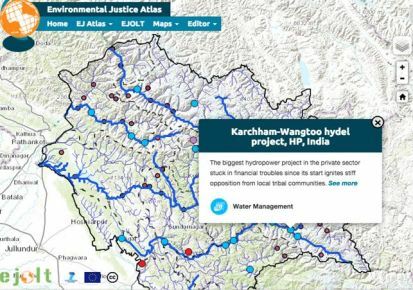 The Featured Map of Environmental Justice in Himachal Pradesh tells the stories of some of them, representing a collective disappointment, but also of the resisting spirit of Himachalis. 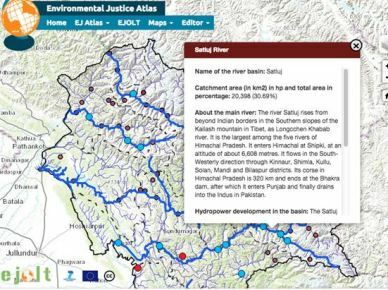 All information is being collected through official documents and reports, reports and articles by organizations and independent analysts like SANDRP and International Rivers, documentation obtained by Himdhara, a local environment action group, through the Right to Information Act and cross-checked with on-the-ground work and substantiated with interviews, newspapers articles and direct observations. The map contributes to show the pace of construction, the expansion of the hydropower frontier, directly linked to a development model based on unbridled exploitation of natural resources for economic growth. Considering the ecological fragility of the region, the impacts are very serious. Especially large-scale construction of dams in the Himalayas, pursued by the Union and State governments for fostering economic growth, has alarmed geological experts. HESCO’s founder (Himalayan Environmental Studies and Conservation Organization) Dr Anil Prakash Joshi noted that policy makers have not learnt from the tragedies in Kedarnath, Nepal and Pakistan and warned about unparalleled damage if an earthquake strikes the region. Joshi said that even though locals have often confronted government officials over construction of dams, the government has constantly supported large constructions without thinking about the consequences on local people and nature. Even Himachal Pradesh University vice-chancellor A D N Bajpai warned that an earthquake could destroy the entire Kinnaur district of Himachal Pradesh because of the number of tunnels there, used for run-of-river type of technology for hydropower generation. The expert committee of the Ministry of Environment and Forests (MoEF), set up under the direction of the Supreme Court, finally makes the clear connection between the mushrooming of hydropower projects in the region and the 2012 floods. Instead of pursing unconditionally an abstract economic growth, why don’t we change our road map to well being through a true environmental justice, defining priorities and needs as well as the appropriate technology to the local conditions? This map wants to draw attention to the risks, the paradoxes of dam industry, the reasons of resistance, and to remind that in these and in many other socio-environmental cases, dissent matters and its voice should not be dismissed. The authors are grateful to the Fundaciò Autonoma Solidaria of the Autonomous University of Barcelona for partly funding the research and technical work behind the map.